Strongly oversold markets often contain a short-term upside edge. Of course oversold can always become more oversold. Wednesday took the SPX down to a 50-day closing low. Additionally, many short-term price oscillators, like the RSI(2) showed extremely low readings. Further selling on Thursday meant another 50-day low and even lower readings. The study below appeared in the Quantifinder on Thursday afternoon. It looked at other times the SPX posted back-to-back 50-day lows and extremely low RSI(2) readings.Instances are a little lower than I typically like, but the numbers are incredibly bullish and seem worth noting. 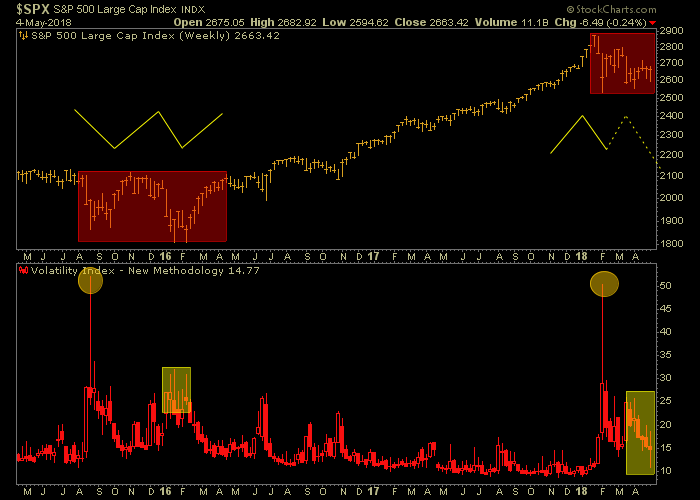 I am seeing several studies right now all suggesting a bounce is highly likely in the next few days. This study is just one such example. I have spoken a fair amount lately about the “split” market, and how that has historically been followed by declines. But not all kinds of splits are bad. 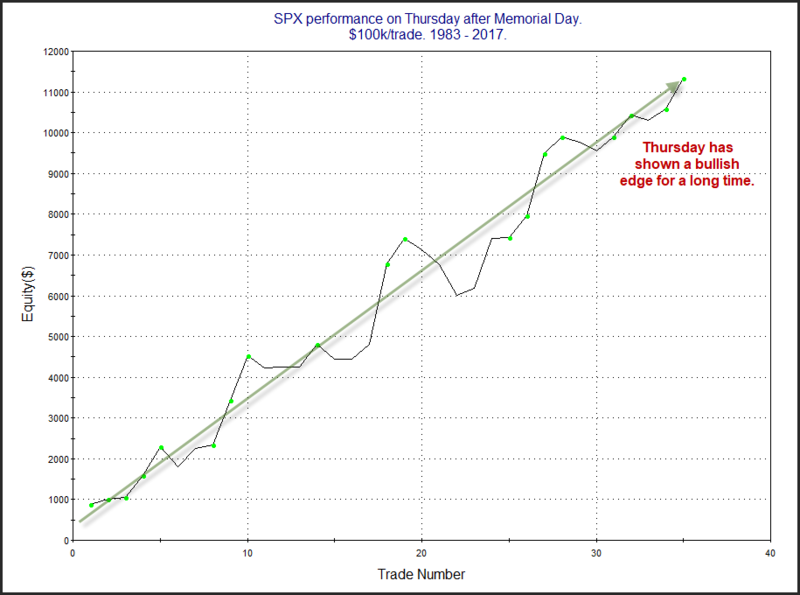 Wednesday we saw the SPX rise while the RUT closed lower. That is not unusual on a 1-day basis. But it has now been several weeks in which they have been heading in opposite directions. 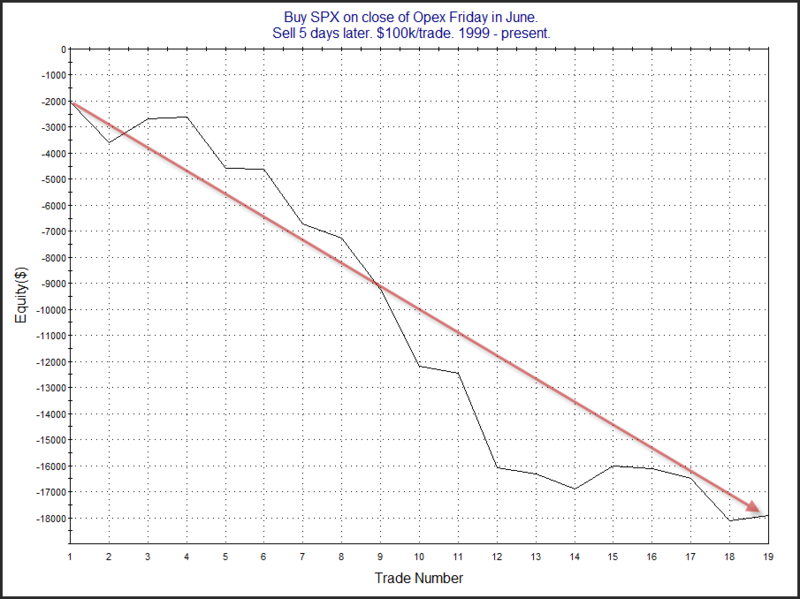 RUT closed in the bottom 25% of its 20-day range on Wednesday while SPX closed in the top 25% of its 20-day range. The study below looks at other times where this occurred. A curious divergence has opened up between the level of the S&P500 and the cumulative level of fund flows into US equity funds (mutual funds and ETFs). The last time in recent history that we saw a similar type of divergence was in the wake of the 2015/16 twin corrections where fund flows tapered off and then after the election it was game on. So the open question is whether this divergence in flows vs price will be followed by a similar type of ‘onwards and upwards’. The counter argument might be that this is actually smart money flows… and a second correction is imminent. Either way, it’s clear that investors are *not* throwing caution to the wind. Before I get started, I wanted to mention that I just received the full-color version of Silicon Valley Babble On, and it is just gorgeous. If you’re one of the well-to-do Slopers out there, you might want to spring for this luxury item, because it looks absolutely fantastic. It’s not cheap at 79.95, but here’s a link if you’re interested. Now I’d like to share with you three charts of the S&P 500 cash index. I have deliberately left off the axis labels, so you’ll know neither the times nor the prices. 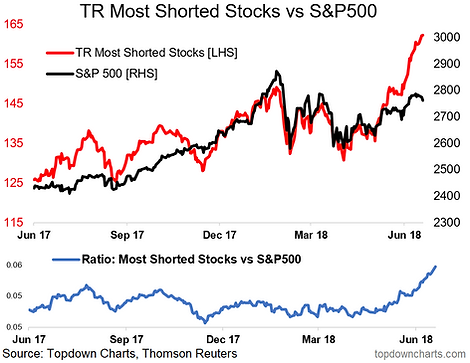 This chart draws inspiration from some of the charts and themes I shared in last week’s S&P500 #ChartStorm, it shows the Thomson Reuters “Most Shorted Stocks” index vs the S&P500 (as well as the performance ratio between the two). When you see the “most shorted stocks index” materially outperforming vs the broader index you can draw one key conclusion: shorts are getting squeezed. Basically what happens in a short squeeze is you get a rush to cover short positions as bears get caught wrong-footed. So you can basically say that much of the recent rally was driven by short-covering. However, as I’ve noted elsewhere there are a few macro undercurrents that are preventing the S&P500 itself from heading unrestrainedly higher, and this is creating a series of winners (e.g. US small caps) and losers (e.g. emerging markets). The size of the follow-through isn’t terribly large, but it has been quite consistent that some follow through was achieved in the next few days. 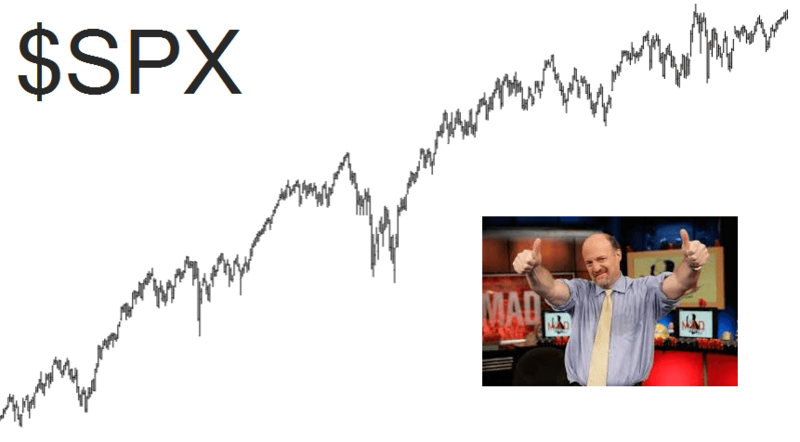 The market is certainly overbought here. But overbought does not always mean an immediate reversal. While evidence is mixed, (for instance, an expected substantial SOMA decline this week is creating a bearish headwind this study suggests the kind of strength we have seen over the last couple of days is often followed by more strength. And it can serve as a nice little piece of evidence for traders to consider as they establish their market bias. The following is part of the Market Sentiment segment of this week’s edition of Notes From the Rabbit Hole, NFTRH 498. I’ve given it a funny name that would be less funny for a lot of people if the scenario actually plays out. Last week we reviewed Commercial Hedgers data that was bullish for the stock market and other sentiment data points that were not. The picture was mixed and our view was that a bounce (to short into, if you are bearish) was likely. Refining that a bit, we reintroduce the ‘M’ retest possibility. It’s not a call or even a favored outcome since the stock market is still generally below markers like the SMA 50 and a series of declining highs. But as Apple showed us last week, this pig can scream higher at any time that animal spirits get unleashed. One problem for longer-term bulls is that unlike the big, ultimately bullish event in 2015-2016 today’s SPX has not seen a corresponding rise in the VIX as the market has declined. The off-the-cuff interpretation of that is complacency that is out of whack with the flat to negative price action over the last several weeks. Here’s the second installment of the new “What the EPS?” series, where I look at earnings trends across sectors, countries, regions…. taking my usual top-down approach. This week we look at earnings trends for the S&P500, specifically the path of forward earnings (up sharply), trailing earnings (up slowly), and estimates of long term future earnings growth (up sensationally*). 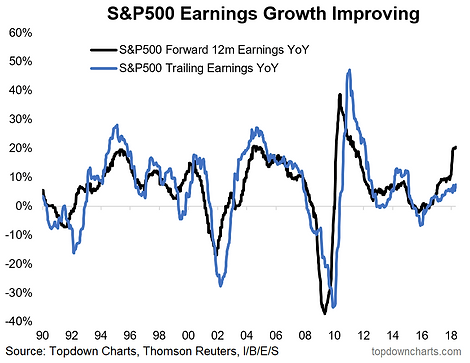 -Forward earnings growth is running hot (thanks to a spike in upward revisions driven by the tax cuts). -Trailing earnings are plodding along, following a recovery from the 2015/16 earnings recession. -Long term growth estimates ave spiked to the highest levels seen since the dot com boom.